SOUTHERN PINES — Dante Miller has enjoyed the luxury of being a standout tailback on the Ninth Grade Academy’s football team. Good games are celebrated and misreads or bad games, if any, are chalked up to a learning experience in the hopes that he’ll learn by doing over the freshman, junior varsity and varsity levels. In high school track, though, there is no developmental program. Miller is put on display on a stage that pits him against varsity athletes with three-plus years of experience. 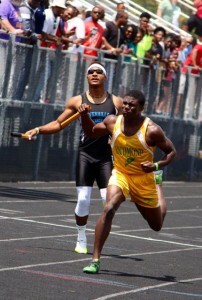 Dante Miller ran out of room in the boys 800-meter relay on Saturday at Pinecrest High School. And on Saturday, the ninth-grader dropped the ball — er, the baton — in the boys’ 800-meter relay during the Class 4A East Region Championship at Pinecrest High School. But all boys coach Eric Gould sees is potential. You see, despite the miscue, Miller anchored the relay team to a second-place finish. Given another 10 feet, the results might have been different — but the outcome was the same. “We going to Greensboro, baby,” Gould exclaimed as he approached relay teammates Erran Greene, Gus Chambers and Jayvon Boyer to talk about their placement — and not what went wrong on the exchange from the third to anchor leg. Doing so isn’t easy. Former Raider Travis Newton was one of the best in the state. Despite the loss of Newton and fellow graduate Isaiah Brewington, the team was seeded second to Overhills by merely 0.15 seconds. On the track, though, Hoke County — the No 4 seed — eked out the victory with a time of 1 minute, 28.21 seconds. Richmond was second in 1:28.35. Gould said the Raiders came to win. Tyler York placed fourth in the boys long jump to advance to the state meet, but just missed – place fifth – in the high jump. Alas, those expectations were muffed on Saturday with the errant exchange on the far side of the track. 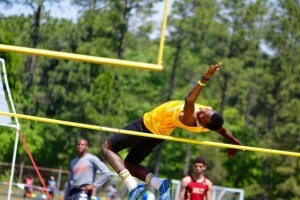 But next Saturday at the Irwin Belk Track at NC A&T State University, anything’s game. All the Raiders had to do was punch their ticket to the show. They did just that — and on more than one occasion. The top four finishers in individual and team events, in each event, qualified for the state meet next weekend. Sophomore Corrisa Wall placed second in the high jump with a leap of 5 feet and Green, a senior, placed third in the 400-meter dash in 49.33 seconds. Senior Tyler York and Miller each placed fourth, with York advancing in the long jump (20 feet, 4.25 inches) and Miller in the 100-meter dash (11.02 seconds). 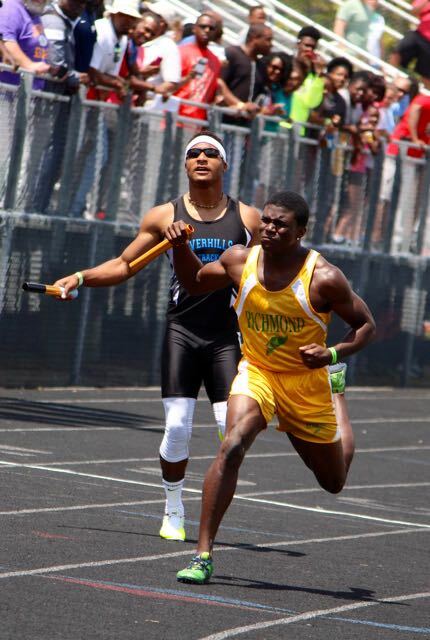 The boys’ 400-meter relay placed fourth as well (43.12 seconds), while the 1,600-meter relay team of C.J. Brewington, Shyheem Monroe, Diamontre Bennett and Greene finished second in 3:21.16. 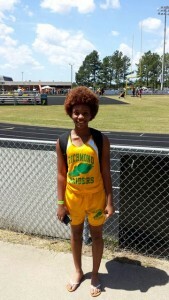 Corrisa Wall advanced to the state meet in the high jump. Seconds are long in track, and blinks of an eye can seem to incorporate a lifetime of experience as the field reaches the finish line. Last year, the Raider boys’ 800-meter relay team lost a state title by a measly 0.03 seconds. “It always come down to the little stuff,” Gould said of a team that’s earned another week to work on just that. * Editor’s note: The PDP apologizes for the inconvenience of looking through the duplication of photos. The technical difficulties couldn’t be helped.